Susan Peirce Thompson, Ph.D. is an Adjunct Associate Professor of Brain and Cognitive Sciences at the University of Rochester and an expert in the psychology of eating. She is President of the Institute for Sustainable Weight Loss and CEO of Bright Line Eating Solutions, a company dedicated to sharing the psychology and neuroscience of sustainable weight loss and helping people live Happy, Thin, and Free. Caryn Hartglass: Hey everybody, how are you doing today? I’m Caryn Hartglass and you’re listening to It’s All About Food and it is all about food, so many things are connected to food, the food we grow, the food we eat, food affects us in so many profound ways and we talk about that here. Sometimes it’s serious, sometimes it’s silly, sometimes it’s joyful, sometimes, I hope it’s always informative, but it’s one of my favorite subjects, food. But I want to tell you I do have some other interests believe it or not. I’ve talked about them from time to time on this program. I’ve been in California now for 8 weeks, we’re here for one more week, we just finished directing a production of Fiddler on the Roof in San Jose. I’m so glad that we got through it, it’s finished, it was wonderful, I’m exhausted. And it was my debut conducting, and I learned one thing that conducting is a fabulous upper body workout. My arms have never gone through what I went through, especially two shows a day with my arms up for three hours at a time, it’s amazing stuff, I recommend it. And you know I can talk about Fiddler on the Roof on a show called It’s All About Food because actually there are some food-related topics in the program. The lead character is a dairy man and one of his daughters is matched up with a butcher. It’s a very lovely interesting story and I was very honored to be a part of it. Now to move on to the heart of today’s program which I’m really looking forward to, I want to bring on my guest Susan Peirce Thompson who is an Adjunct Associate Professor of Brain and Cognitive Sciences at the University of Rochester and an expert in the psychology of eating. She is the President of the Institute for Sustainable Weight Loss and CEO of Bright Line Eating Solutions, a company dedicated to sharing the psychology and neuroscience of sustainable weight loss and helping people live Happy, Thin, and Free. And her new book is coming out very soon, Bright Line Eating: The Science of Living Happy, Thin and Free. Susan, welcome! How are you? Susan Peirce Thompson: Aw, hi Caryn it’s so good to be back with you. Susan Peirce Thompson: Yes, a long time ago! Caryn Hartglass: It was and so much has happened, amazing! Susan Peirce Thompson: Yeah, it’s been a crazy two years of my life, indeed! Caryn Hartglass: Yeah, so you had connected with Ocean Robbins to see if there was some sort of collaboration that could be done and I had been working with them, we were developing a course at the time and Ocean asked me to speak with you and I was so blown away when I spoke with you, with all of the information that you had. I have an engineering background, I believe in science, everything you said was science-based and that’s what I loved about it. And so over the last couple of years you’ve actually put all of this into amazing action and now you have a book. Susan Peirce Thompson: Yeah, I mean the whole purpose at the beginning was to write a book, actually that was the whole purpose of everything, but you know it’s interesting I’m starting to think that actually the book was the universe’s way to get me off my duff you know and do all this other stuff. Yeah I mean since we talked last, you know, Bright Line Eating starting, I started these online boot camps; since we last talked 450,000 people have joined my email list; since we last talked the videos, the science-based videos on the neuroscience of food addiction and why it is that some people just really can’t seem to lose weight and how their brain is malfunctioning and what they can do to reverse that, those videos they’re called the Food Freedom video series, they’ve been watched by hundreds and hundreds of thousands of people in 190 of the 195 countries on earth, everywhere except for like North Korea where they don’t have internet access; and yeah we’ve helped thousands and thousands and thousands of people to get happy, thin, and free, to lose all their excess weight and keep it off and our program works orders of magnitude better than any other weight loss program on the planet. We started a long-term research follow-up study, a research program that’s following people, and the results are starting to come in from the earliest people who were just joining the program probably around the time you and I talked, around two and a half years ago, we’ve got our earliest people two and a half years of data on them, and yeah we have a lot of weight loss maintainers, people who used to have BMIs in the overweight or obese or morbidly obese range who now have a BMI of 20, 21, 22, experiencing little to no cravings ever, and improved mood, reduced medications, like really living the dream, like finally Bright Line Eating has solved their food problem, their weight problem, their food problem, and because it’s all about food as you know so many other issues that go along with it, like the identity formation I just got, anyway, long story, I talk too long sometimes, I don’t want to go off on a soliloquy, but I could keep going, it’s been an amazing two years. Caryn Hartglass: Yes, well I will encourage you to keep going but you do have a talent for talk, I’ll give you that! Susan Peirce Thompson: Thank you, haha! Caryn Hartglass: So what is amazing is the weight loss industry is huge; it’s a big money maker. You mention in your book about 2 billion people worldwide are overweight, 600 million are obese here in the United States, 108 million people are on a diet and most of them don’t work. Susan Peirce Thompson: Yeah, they don’t work at all. 99.9% of people will not lose their weight and keep it off. Get down into their right size body, which is what they want, you know to look good in a pair of jeans, to feel good in a bathing suit. Caryn Hartglass: So some of what’s happened, now I know that food issues, there are many different parameters that affect people’s relationship with food. Many people have emotional issues even when we don’t even consider the industrial food that they’re eating, so that’s a big problem, but your program addresses so many things, the issue of our brain getting totally messed up on food that we’re not meant to eat and then also emotionally related issues. One thing, you told a story in your book about bringing your daughter on a road trip with a friend when she was two years old and she got all angry and screamy and wasn’t being accommodating and your friend offered a little snack for your daughter, and I was like such a simple little thing like that and you talked about the enforcement of negative reactions and food and how that relationship grows. Caryn Hartglass: And everybody has that. Susan Peirce Thompson: Totally! Parents offer cookies and crackers when they want us to shut up essentially, and it’s the beginning of learning to stuff it all down. Caryn Hartglass: Okay, the other big thing, and I remember you talking about this when I first spoke with you is this sugar and flour thing. These are white powders, just like cocaine, and sugar is more addicting. Susan Peirce Thompson: Yeah, I mean to rats it is, they pre-addict rats to intravenous cocaine, they shoot them up with cocaine over and over and over again, and then they let them ride for a little bit without a hit of cocaine so they want one, and then they offer a choice between cocaine and sugar, and they prefer the sugar under those conditions, already addicted to cocaine they would rather have some sugar. Caryn Hartglass: Yup, and I know the influence of sugar on many people, it is so crazy! Caryn Hartglass: I’m beating the drum. Susan Peirce Thompson: Oh you’re beating the drum! I was like, “Why is she starting to type, doesn’t she know she’s loud?” haha! There is controversy around food addiction, and there are papers published saying it’s not really a real thing and what I want to say about it is there is no controversy around it among people who study neuroscience and addiction. People who study the brain and addiction to anything understand that food addiction is real, because it is the same thing in the brain and the brain of a food addict is the same brain as the brain of a heroin addict, a cocaine addict. And so the controversy exists around, for example, nutritionists who treat bulimics and anorexics and they really recoil against any foods being labeled as bad foods and they think that that’s not a good thing for us to demonize these foods and that kind of thing. I mean my PhD is in brain and cognitive science and I am a food addict myself, I have a super addict-able brain, and I just kind of shrug and I’m like the data is really clear actually when you look at the brain. When you look at the nucleus acumens, the seat of real addiction, and I personally, my background is I’ve been addicted to crystal meth, I’ve been addicted to crack cocaine, I got clean when I was 20, I haven’t had a drug in a long time but I know what addiction feels like and sugar is worse. I’m telling you, it’s worse. Caryn Hartglass: Okay, now myself, me, Caryn, I have never had a weight loss problem. I guess I’m a fortunate person, and so when I hear about programs for diet it’s hard for me to relate. And I see it all around me, I know people have problems, but from my own point of view I’m like, “Come on, just get disciplined, just do it!” I’m a very disciplined person, and you talk about will power in your book and I know I have a lot of will power, but I acknowledge now that we are not all the same and many people have had their brain affected by sugar and flour, industrial foods, processed foods, and I want to talk about your program a bit. So I know people have said that your program is rigid and I had an epiphany this morning because I want to enforce the importance of that. Caryn Hartglass: Yes, it is! Susan Peirce Thompson: Pretty structured. Caryn Hartglass: So I’ve been vegetarian since 15, vegan since 30, it’s been over 28 years for me as a vegan, and I think about my own lifestyle and people have said to me, “Oh my God, your diet is so rigid!” And I don’t think it’s rigid, and I do all kinds of things; I distill my water every day, I sprout, I cook my own food, I make things from scratch, but for me it’s like routine and a pleasure because I know what I’m getting out of it. And so I realize it’s not rigid to me because I know what my goals are, I know what the benefits are, so for people who really want to lose weight they need a systematic plan, not easy in the beginning, and then they retrain, the brain gets healthy, and happy ending. Susan Peirce Thompson: Yeah and you know it’s also so perfect that you brought this up Caryn and I love your examples and I also want to propose it’s not rigid to you because you know your goals, you know your values, you know your motivations, but it’s also not rigid to you because you have these habits around it, right? Just like brushing your teeth twice a day, every day like says the person in 1750, right, brushing your teeth twice a day, every day, like that sounds so extreme to someone from 1750 where they brush their teeth never or you know I don’t know what their oral hygiene was like then but I’m banking that it wasn’t that good. And to us it’s like uh not that big of a deal dude, you put the toothpaste on the toothbrush and like I get it done with zero effort, right, and the reason is because I have this amazing pattern of automaticity. It’s not being governed by the part of the brain that governs choice and decision that fluctuates with my mood and my level of motivation, it happens in the basal ganglia where stuff just gets executed automatically, you’re not thinking about that, and so in the same way eating three meals a day and not snacking in between, yeah it’s rigid at first and then it’s like well actually breakfast, lunch, and dinner get wired into your routines really nicely and then the ‘no thank you’ in between become really automatic too and all of a sudden the weights pouring off and your eating is in a groove. And so yeah it’s hard at first, it’s rigid at first, people say it’s rigid they also say it’s extreme, to which I look around at the consequences as a society that we’re suffering from right now from the way we’re eating and my eyes widen. I say, “You want to know what’s extreme? 80,000 people in America this year are going to walk into a leg amputation that they knew was coming because they can’t stop eating the way they’re eating.” Like they’re diabetic, their doctor has told them the next time we’re cutting off your leg, and they keep eating. 80,000 people, I’m not talking about 5 people every 10 years, I’m talking about 80,000 people every year. And you know our kids, that’s diabetes, and half of our kids of color are going to grow up and have diabetes, a third of our white kids are going to grow up and have diabetes, one third. Look around us, go to a school and count them up, 1 in 3. Caryn Hartglass: Oh but that’s normal! That’s not extreme. And that’s like triple or quadruple bi-pass surgery; break open my sternum, sure, that’s great, I don’t want to change my eating habits, no give me major surgery! Susan Peirce Thompson: Right, two thirds of people, literally two thirds of people dying way too young, totally in pain, totally uncomfortable over their bodies and the foods that they’re eating and maybe not being able to see their granddaughter get married or whatever it is, and it’s like well yeah I guess it’s extreme but I think that really we’ve accepted terrible consequences, not to mention the financial consequences that are coming over the next 10, 20 years, they’re here already but the finances are going to get worse. That’s what’s going to get really scary; we can’t afford to eat the way that we’re eating. So for the one third of people who have really addict-able brains like mine and the other one third who have moderately addict-able brains, you sound like a one third who doesn’t have an addict-able brain Caryn I’m just guessing, I don’t know if you’ve taken a susceptibility quiz, do you know what your susceptibility score is? Caryn Hartglass: I think I took it when it first came out and I don’t remember so I’m going to have to take it again. Susan Peirce Thompson: Yeah, I think you’re low, but for the people who are high like me it’s just unfortunate, our brains are going to work against us unless we take some pretty drastic steps, like quitting smoking is drastic if it’s 1955 and everybody smokes and you’re trying to get healthy, you know the deal you know it’s not healthy, they’d say, “Come on, let loose, have some cigarettes it’s fine,” but once you know better. Yeah it takes some drastic action to get healthy sometimes. Caryn Hartglass: Now your program incorporates some concepts of the 12-step program. Caryn Hartglass: Can you talk a little bit about that, I mean some people have like knee-jerk reactions, “Oh, 12-step program,” but there’s good things in the 12-step program and you’ve taken them and incorporated them. Susan Peirce Thompson: Yeah, yeah, totally. I mean my background is 12-step programs. I got clean and sober in a 12-step program when I was 20. I’d spent 20 years, literally 20 years in 12-step food programs, and I’m not in one right now but that’s my background for sure. And in essence, I mean I guess the biggest part of the basis from a 12-step program is that abstinence leads to freedom, like if you’re an addict quitting leads to freedom. For the cigarette addict quitting smoking leads to freedom, the nicotine moderation program, not so much, the like I’ll try having one or two or three cigarettes a day, not so much; quitting smoking leads to freedom. My program also incorporates a lot of the support of 12-step programs, that like we don’t do this alone, we don’t do it in a vacuum; it really helps to band up with other people and do it with support. My program incorporates a lot of sort of the mental retraining of 12-step programs, like the ‘one day at a time’ mentality and things like that. And then there’s a lot of things that are different, my program is really rigorously scientifically grounded, where 12-step programs don’t talk at all about the science of what works and what doesn’t work. My program is malleable based on new science that might be done, that might come out, and so there’s difference for sure. My programs, all the supports online so there aren’t like face-to-face meetings people go to or anything, or sponsors or anything like that. My programs much more online, it’s self-directed and stuff like that, but there’s definitely a legacy of 12-step influence in Bright Line Eating for sure, and proudly so. Like I think 12-step programs are amazing, and I love them, and yeah I’m very grateful to all my 12-step brothers and sisters who gave me my life back when I was 20 and a crack addict, very grateful. Caryn Hartglass: Okay, the other thing I want to talk about is weighing food, and I want to first say where I come from. Someone who has never had a weight problem, and I’ve always had a focus on eating healthy, and I have found that foods that I believe, based on science, are the healthiest for me, and I’m a big fan of Dr. Joel Fuhrman and his g-bombs (greens, beans, onions, mushrooms, nuts, and seeds), I love the fact that I can eat huge giant salads when I want them and eat all the beans I want, and I have freedom that way because I have a whole pool of foods I know are good for me and which ones I can eat all that I want, and I eat them when I want and it’s cool. But you have designed a program of weighing food and eating at specific times and I acknowledge that that is an important part of the program. Susan Peirce Thompson: It is, and there’s, I mean I don’t know how much controversy is active but I do know that there are some YouTube videos out there of interviews of people who are really prominent in the whole foods, plant-based community talking about that weighing food is ridiculous and totally unnecessary. Well first of all what I love is that you prefaced everything you said with, “I’ve never had this issue,” right? So if you have a brain that doesn’t work this way I’m sure it’s really easy to misunderstand the argument that there’s no animal out there in human nature that needs to weigh its food, to which I want to say, “If you raised those animals on the types of food that we raise our kids on, with sugar and flour being introduced by age 1 to pretty much everybody, I mean rice flour is the first food that’s put in baby’s milk, that’s an addictive food, and 60% of American 1 year olds are eating candy every day. So if you rewired their brains you would find probably that one third of them would develop food and weight problems to the point where you would need to restrict their food quantities probably for them to get back down to a normal weight.” So I mean I guess what I want to say about weighing food is that there are a lot of refugees in Bright Line Eating from the whole food, plant-based world where they just tried to eat the right foods in any quantity at any time and they just couldn’t get to the promise land. What happened is their food choices started skewing toward the black bean brownies, the oat date bars, and they would try and not eat them so much but they would have these moments where they would find themselves standing in front, we’re talking about Star McDougallers, like standing in front of the fridge shoveling black bean brownies into their mouth out of the freezer by the fistful and thinking, “Well this is okay because this is an allowed food.” So I just want to say that quantities in and of themselves are potentially a real issue, like I myself can probably eat 12 pounds of roasted butternut squash, I can eat 5 massive honey crisp apples, I could just overeat on the whole real food, and then you add any access to cashews and raisins? Forget about it, right? So yeah, the brain of an addict-able person will wire a lash to trick them into eating more food than they need and they will keep weight on and they will be whole food, plant-based, eating only whole food, plant-based foods like you said on the Joel Fuhrman list, and they will not be able to keep themselves from eating the slightly more hyper-palatable versions of those to excessive quantities, and it will keep them unhealthy and it will keep them not achieving their goals. Caryn Hartglass: I want to say that Joel Fuhrman will tell you not to eat too much of certain foods but because it’s not a black-and-white all-or-nothing for some people they don’t know how to moderate. Susan Peirce Thompson: Yeah, they can’t. It’s like telling the cigarette smoker to just have two or three cigarettes. They try and they’re back up to a pack a day. They feel shameful and like it’s their fault. I guess all I want to say is I’m a big believer in a couple things here. First of all, the susceptibility scale; some brains are highly susceptible to addictive foods and unless you’ve had a brain like that I just don’t know what to tell you, that’s how my brain works, I’m like the Lorax who speaks for the trees, right? I advocate for people who have a brain like that, like if you don’t have one you just don’t know. Before I got slender using these principles, including weighing food, I had run a marathon, I was happily married, I had a PhD in brain and cognitive sciences, I could set my mind to anything and solve it, achieve it, do it, I climbed tons of massive mountains, literally physical mountains, like rock climbing, mountaineering, and I could not shed those 50 pounds those 60 pounds that I was carrying. I just couldn’t shed them, and as soon as I started putting my food on the scale I had the most tremendous freedom; for me it produces freedom in the same way that quitting smoking finally produces freedom for the nicotine addict. And I know that we’re not always talking about addictive foods, honey crisp apples and roasted butternut squash are not on the addictive foods list, I can over eat even foods that I would eat in normal quantities; once I weight them they’re fine. I put my cashews on the scale, they’re fine, I have a moderate amount, it works. Caryn Hartglass: Well I’m glad you’ve found that and I’m glad you’re sharing it with other people. I just wanted to make a comment, you mentioned the Star McDougallers, and Dr. John McDougall, I think he’s done great work, but I’m not a believer in the starch solution and when he tells us that we can eat pasta and potatoes, I love the way that he says potatoes, and all kinds of other grains, I mean I know people that have gone on some of his retreats and they gain weight. So unlimited starches like that is not a way to reach your ideal weight, I don’t believe that. You know people that don’t even pick on a diet and they just decide they’re not going to eat any bread anymore, they lose weight. It’s that simple, for some people. Okay, so now you have lots of systems in place for people to follow and it’s great. I know that if people do these, even though it’s uncomfortable or time-consuming, if you have a goal to lose weight and you never have been able to these things will get you there. One of the things I just wanted to mention because you never hear anybody mention this, and that is making your bed. Susan Peirce Thompson: Haha yeah, it’s one of the tools! Caryn Hartglass: You know, I don’t know why I’ve never brought it up before but when I read it I smiled because making your bed in the morning is the way to start the day. Respecting yourself, cleaning it up so that it’s tidy and neat, and then at night you get to unmake your bed and it’s just a wonderful thing to start fresh every day. Susan Peirce Thompson: Same with you eat the meal and then you clean up the kitchen sink, it goes to bed after every meal, three meals a day, quiet, clean, sponge squeezed out sitting on the side like it’s all done. Now none of that I ever did before I started not eating sugar and flour and weighing my food, seriously I couldn’t do laundry, I couldn’t do dishes, I couldn’t get out of bed before noon, I was a mess. Susan Peirce Thompson: Yeah there’s a lot of support in the boot camp, it is very hands on. The book, I wanted to put everything in the book because like you said it’s affordable and I really want this message to get out especially in our poorer communities where it’s needed so much and we couldn’t put everything thing in the book. In the boot camp modules we never pulled more than, I’d have to go back and check, 40 or 60% of each module. We made sure we didn’t pull more than 40 to 60% and we figured out that that would result in the book that wasn’t so heavy that it would not be portable on a plane. So it’s not all in the book but the basic program is, for sure, someone could read this book and potentially, especially if they were an introvert and didn’t need a lot of the support, could potentially get happy, thin, and free just from the book, for sure. Caryn Hartglass: I know for me, and again I’ve made my disclaimers, never had a weight loss problem, the way I learn is from books. I don’t have a lot of patience for videos, I find it very efficient, I get the nuggets that I need from reading, so I imagine there are other people like me out there. But I did have the opportunity to view everything in your boot camp and I watched all the videos. Susan Peirce Thompson: Really? That takes a lot of time. Wow! Caryn Hartglass: It did, but I worked it into my schedule, and there was a lot and I think for people who are really trying to lose weight, I think it’s really a benefit to have you as the cheerleader. You’re very candid and you share a lot of personal stories, makes it very real, I think it’s powerful. Susan Peirce Thompson: Aw, thank you. Caryn Hartglass: And I watch a lot of videos, some of it I do to review programs for people that are considering sharing them, and there’s a lot of crap out there in the world, there’s a lot of misinformation, and I enjoyed your videos. Susan Peirce Thompson: Aw, thank you, thank you! I’m stunned that you watched them all given that you don’t need to lose weight, this isn’t your issue. I’m touched actually, like I’m kind of moved that you watched all the videos in the boot camp, that’s amazing. Caryn Hartglass: …people out there to lose weight, and that’s fine. Susan Peirce Thompson: Yeah I’m a big fan of whole food, plant-based, I was really strictly whole food, plant-based for a long time, I do eat some animal food here and there these days, but basically my philosophy around all that is, I actually do talk about plant-based eating in the book and in my videos as you know and I do steer a lot of people, you’d be surprised how many people do the boot camp just from that gentle influence start to be like okay what does tofu taste like, okay I’m going to have some beans for my protein. But my philosophy is I’m asking them to give up sugar entirely, and all sweeteners, flour entirely, every kind, I’m asking them to only eat three meals a day, I’m asking them to weigh their food, and their goal, supposedly for most of them, is to lose weight and live in a right-size body and if there’s actually things that won’t keep them from that goal I don’t feel right excluding them from the plan. Like I know that mayonnaise isn’t healthy, for gosh sakes, like conventional mayonnaise, right? Not healthy, but it’s on the plan as an option for fat, I’d rather you have avocado but if someone wants to put some mayonnaise in their hummus or their tuna salad like really they’re eating so many vegetables now, they’ve cut out processed food entirely, it really gets them so much of the way there and then my hope is that once choice is restored and they’re eating they will start to really learn about what’s actually healthiest and start going down that path. I just don’t feel right forcing them down that path because that’s not what they come to me for, they can go to Joel Fuhrman for that, you know what I mean? There are other people doing that well already, that’s not my job, my job is to get them into a right-size body and restore choice around their eating for them so they’re not a slave to Ben & Jerry’s anymore, and then I’ve launched them on a path where the other experts in those other areas can pick up. So I just try to stick to my job. 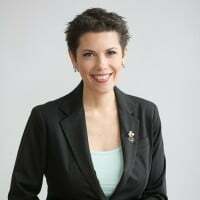 Caryn Hartglass: Not a slave to Ben & Jerry’s, which also has vegan ice cream these days so, and the unfortunate thing, there’s more and more vegans out there and businesses are realizing it’s a market to attract so there are more and more processed, unhealthy foods. You can be a fat vegan. Susan Peirce Thompson: Oh God and you can get super fat in the health food store. I mean health food stores these days are only half health food, right? Caryn Hartglass: They’re not healthy. Susan Peirce Thompson: Yeah, you still have to just walk around the perimeter of a health food store to get out intact. Caryn Hartglass: Oh I’m glad you mentioned that. I walk into a grocery store and most stuff I see is not food. Susan Peirce Thompson: Right, it’s not food. Caryn Hartglass: And that took a long time to get to that place but I see boxes, it’s like I don’t look at that, that’s not food, bags of chips, that’s not food. Susan Peirce Thompson: Yeah, it’d be great if everyone could get to the point where they could walk into the grocery store and just point and go like poison, poison, poison, poison, not food, poison, not food, poison, not food, poison. Yeah it’s not, and that’s one of the mantras I teach my boot campers is that that’s not food that’s poison to me. That’s not my food, that’s poison to me. Sugar, for example, the technical term is a chronic dose-dependent pato toxin, it’s a toxin. Caryn Hartglass: Okay, you have this 14-day challenge and it’s still going on? Susan Peirce Thompson: It is, yeah! Caryn Hartglass: I have a link on my site but tell us what the 14-day challenge is, what we’ll get out of it. Susan Peirce Thompson: Well the boot camp is a big investment in every way, right? It’s a full on life transformation and I just wanted people to have a sense of what they were getting into. Especially for some people who aren’t dive-all-in-ers in a cold swimming pool, I’m not a dive-all-in-er, I really want to wade in, and don’t splash me while I’m wading in, let me test it. Caryn Hartglass: I’m with you. Susan Peirce Thompson: So I want to really give people 14 days to get a sense of what it’s like and I hold their hand every step of the way through getting started and I give them a two-week test wading experience of what Bright Line living feels like and then they can decide to go full in for the boot camp or not, they can just walk after that or whatever. People lose a lot of weight during it, they end up feeling great, but also they get a sense of what it’s like to start to have their brain rewired for these habits, I mean we knew already from the boot camp that almost 60% of people by the end of week 2 are experiencing little to no cravings ever, almost 60% of people. By the end of the boot camp it’s 84% of people, and so we knew people would get a huge benefit right away from just getting the sugar and flour out of their system and giving it a try. So the 14-day challenge there’s no support, there’s no online community for this, you do it by yourself but I hold your hand and it’s also super inexpensive, it’s $29, and right now it’s coming with a free copy of the book which is a $25.99 hard cover Barnes and Noble book. So that’s a ridiculous deal obviously, that’s going away when the book comes out that will go away, but anyway yeah that’s what you get out of it. You get to get a sense, it’s like a challenge, I want you to challenge yourself. Do you have what it takes to live like the world’s most successful weight loss maintainers live? This is what it takes, if you’ve got a persistent weight problem this is what takes. And I show you what it takes and you can get a sense of how it sits for you, because Bright Line Eating is not for everybody so give it a try, see if it fits. Caryn Hartglass: I like that, and Bright Line Eating is not for everyone. I imagine there are some people who have tried your boot camp and then slipped away from it. Susan Peirce Thompson: Oh yeah, 20% of people get a refund. They’re like hell no, haha! Caryn Hartglass: But you know some of those people that backed away I’m sure have not succeeded at losing weight. Susan Peirce Thompson: Oh yeah right, obviously, and they send us love notes. They’re like I love you, I love this program, but this is really not for me. It’s not like we’re doing wrong by them, you know some folks think it’s awful that we have such a high refund rate and I’m like I think it’s really a good thing, why shouldn’t we want people to try it? And if it’s legit not for them then they move on, I think it’s a good thing. Caryn Hartglass: I think it’s a good thing, I think you’re a good thing Susan. Susan Peirce Thompson: Haha, you’re so sweet! I liked you before, I remembered how much I liked you in the first interview, you’re a doll, you’re a good thing too, you’re doing good stuff in the world. Caryn Hartglass: So you have a book signing on your release date in New York I think, March 21st? Susan Peirce Thompson: I do! Tuesday night, March 21st, I think there are still a few tickets left, it’s pretty full but I think there are a few tickets, I don’t know if you can throw a link to that on your site but yeah. Caryn Hartglass: Oh yeah I can! Susan Peirce Thompson: Awesome, awesome. Caryn Hartglass: How long are you going to be in New York? Susan Peirce Thompson: Like 6 or 7, well it looks like I’m getting flown out to be on The Doctors TV show in LA, that’s going to extend my trip in New York City because I’m not going to fly back home for 24 hours, so I’m going to be in New York City now for 8 days actually. I think I’m going to fly in on Saturday and leave the following Sunday a week later, so yeah. Caryn Hartglass: Wonderful! Okay and I hope you can knock some sense into those doctors on The Doctor. Susan Peirce Thompson: Yeah right? Good luck to me, haha! Caryn Hartglass: Okay, very good. Okay it’s been a pleasure talking to you Susan, I was so excited to hear about your book and to speak with you again and to see all the success that you’re having which means many people are having success with weight loss and that’s what it’s all about. Susan Peirce Thompson: They are, ridiculous levels of success and we’ve got a research program and we’re documenting it so you’ll be seeing papers, Caryn, published in peer-reviewed scientific journals more and more. I think the first one’s in press right now or it’s submitted right now and yeah, we’re about to change the entire field of sustainable weight loss over the next decade or two. Caryn Hartglass: Woohoo! Well maybe this is why you’ve been put on the planet and you have had to go through a lot to get to where you are and we barely even touched on that, I don’t want to go into that now but if you want to hear about Susan’s story it’s all in the book. Susan Peirce Thompson: There you go, get the book, good book, very proud of that book. Caryn Hartglass: It’s not pretty, the endings pretty but the beginnings rocky. Okay, big hugs to you, thank you so much for joining me on It’s All About Food. Susan Peirce Thompson: Aw thank you Caryn, so much fun, thank you! Caryn Hartglass: You’re welcome! Okay, that was Dr. Susan Peirce Thompson the author of Bright Line Eating: the Science of Living Happy, Thin, and Free. Let’s take a two minute break and I’ll be right back. You’ll need to contact the folks at BrightLineEating.com. This is Responsible Eating And Living, a nonprofit organization.